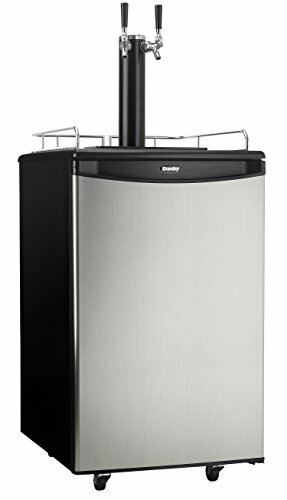 Whether you are a beer drinker or an avid entertainer you will be the best party host with this ultimate indoor freestanding kegerator by Danby Appliances. This dual tap keg cooler is an exceptional addition to any wet bar, game room or man cave and provides the convenience of two different cold beers on tap at once. It uses R600A refrigerant and has an automatic-defrosting system which makes for an excellent product with hassle-free maintenance. This keg cooler includes a single gauge regulator, CO2 tank and all required hardware. It has a precise mechanical-thermostat to keep your beer cold and a spotless-steel finish resembling stainless-steel but much easier to clean. Did we mention it has a scratch-resistant worktop? Furthermore, this unit includes an American Sankey coupler, a chrome guard rail and drip tray, and optional swivel castors for easy portability. The door hinge is reversible which allows you to adjust it for either left or right-handed opening.